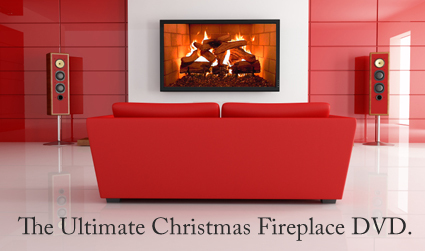 Turn ANY TV into a virtual Fireplace, Waterfall or Ocean view window! 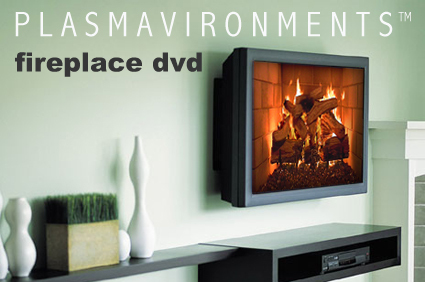 The Plasmavironments™ DVD is the Fireplace DVD that gives you more than just a fireplace. 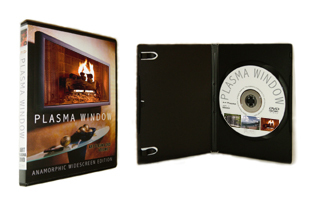 The Plasmavironments™ DVD features warm, glowing flames that fill the entire screen. Twinkling embers add a cozy touch that lights up any room. Select the Christmas music track from the menu, and you have instant Holiday ambience! It's the Ultimate Yule Log Fireplace DVD. The DVD includes a natural log fireplace, a steady loopable gas fireplace and several "Malibu to Maui" ocean and waterfall scenes, plus four Dolby Digital® soundtracks including Christmas music, the natural crackling of the fireplace or a relaxation soundtrack! The Plasmavironments™ DVD replicates the look of a real fireplace without the mess of ash and soot. For a warmer, summertime feel - select the tropical waterfall or ocean view. Perfect for those bigger 42 inch to 65 inch wall mounted Plasma & LCD flat screen TVs. They'll turn your flat panel TV into a virtual window. The Plasmavironments™ DVD is the ONLY Fireplace DVD designed specially for widescreen Plasma & LCD TVs and it was the FIRST Fireplace DVD shot in stunning 16x9 High Definition (HDTV). It will even work on regular 4x3 television sets without stretching the picture or adding ugly black bars on the sides and top. Works on both widescreen and regular TVs without stretching the picture. We sent our Plasma Window cameras from Malibu to Maui to capture the unique Ocean and Waterfall scenes on each DVD. Each view is shot in 720P High Definition. You can almost feel the heat of the fireplace! 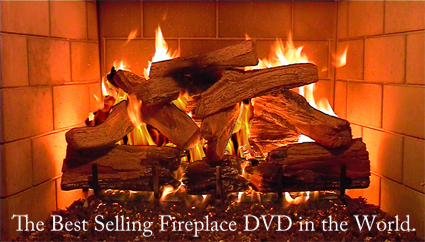 We've designed this DVD to be safer for Plasma TVs than other Fireplace DVDs. The log Fireplace scene plays for 30 minutes before starting over. Each Waterfall & Ocean scene plays for 5 minutes before cycling to the next scene. This helps prevent image burn-in on Plasma TVs. Our custom DVD menus also allow you to loop each individual Ocean or Waterfall scene indefinitely. Select from several Dolby® Digital soundtracks - The natural sound of the Fireplace, Ocean, Waterfall... a jazzy "chill" soundtrack, a classic relaxation soundtrack or a festive Christmas track. The Plasmavironments™ DVD provides hours of relaxation and entertainment for the whole family and is great for parties or offices. The Plasmavironments™ DVD is available now! Have a Blu-Ray player? 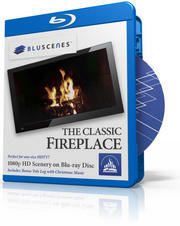 Check out our BluScenes Blu-Ray Fireplace. Available now!